Identity Matters: Will Alaska's Cannabis Entrepreneurs Sell 'Marijuana,' 'Ganja' or 'Pot'? More than two years ago, Leif Abel sat around a table with his brother and his father and a list of about 50 possible names for the marijuana cultivation business they wanted to start in Kasilof. After considering whether to take on an image that clearly sends a message about cannabis or perhaps something more discreet, they landed on the name Greatland Ganja and a logo that prominently features a cannabis leaf. As more states contemplate legalizing recreational marijuana, the businesses that pop up are going to need banking solutions. Fortunately for them, more US banks are becoming willing to dabble in the cannabis trade. Over the last two years, the number of banks and credit unions open to dealing with marijuana businesses has increased by almost six times, the Associated Press reported, citing federal data. Back in March of 2014, only 51 banks and credit unions in the country were willing to deal with cash from pot businesses, but the number now stands at 301. 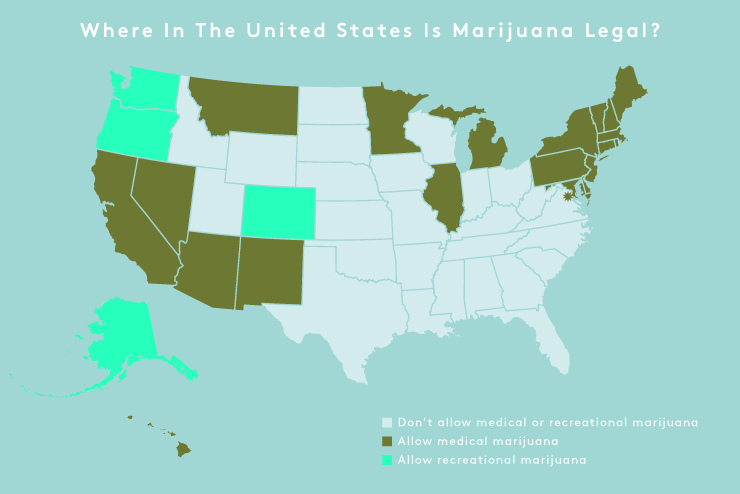 This year alone there have already been more than 50 legislative initiatives around the country aimed at legalizing or decriminalizing medical or recreational marijuana. The cannabis industry made $5.4 billion in 2015. Legally. That's $5.4 billion worth of businesses growing and cultivating plants, processing and shipping products, and selling marijuana, cannabis oil, and all manner of edibles at dispensaries. That figure is forecast to hit $22.8 billion by 2020 according to the latest State of Legal Marijuana Markets Report from ArcView Market Research and cannabis-focused data analysis firm, New Frontier. Yesterday we witnessed the release of Batman vs. Superman: Dawn of Justice, a highly anticipated movie depicting an unstoppable force and the proverbial immovable object. But what many people might overlook is that we've been witnessing a real-life battle for years beyond the confines of the movie theater between a seemingly unstoppable force known as marijuana, and the federal government which has maintained its position as the immovable object. Anchorage officials will mark off the minimum 500 feet between schools and pot shops by using walking distances, not a straight line, the Anchorage Assembly decided in a unanimous vote Tuesday night. The decision means more potential properties will be available for pot businesses in Anchorage. The Assembly’s vote, a reversal from two weeks earlier, effectively loosens restrictions on where businesses will be allowed to open by in some cases shrinking the off-limits zone around schools and other restricted places. hat won’t apply to Chugiak and Eagle River, where pot shops will need to be at least 1,000 feet away, measured by pedestrian walking distance. Wednesday is an important date in the state’s long process of licensing commercial cannabis in Alaska: The deadline for the state to have a permit application up and running. “From the stand-point of somebody that wants to go into the industry, February 24th is actually the starting point, it’s not a deadline at all, it’s really just the first date,” said Bruce Schulte, Chair of the state’s Marijuana Control Board. For anyone expecting to start buying cannabis products in stores, there are still many months to go before the start of legal sales.